Only the other day Sr. Rose and Sr. Nazareth got a call to say a number of would-be refugees had been washed ashore nearby and were being held at the local police station. They went to visit the people there and to bring some food, assuming they would be hungry and exhausted after their ordeal. The Sisters are no newcomers to stories of attempted escapes by sea to other islands in the Caribbean where many hope to find a better life than that here in Haiti. They have met people who have attempted escape numerous times; people who have been lucky to survive the attempts. Despite their lack of success in getting away to a better land and a perceived better life, these people know they are lucky to be still alive. During their attempts many of them have experienced injury themselves and have also seen many of their counterparts drown or been eaten by the sharks in the Atlantic Ocean. What met the Sisters at the police station was a group of Cubans and a larger group of Haitians who had been washed ashore due to winds. The Cubans were ‘big, strong men’ with some chance of survival; the Haitians were thin, weak and distraught. 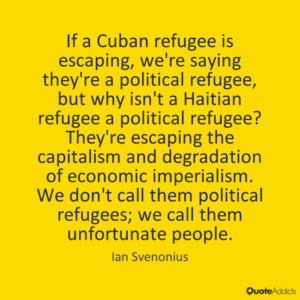 When I asked the Sisters what was likely to happen to these people now, they said they would expect the Cubans to be sent back to Cuba while the Haitians would also just go back to their old life…Until some of them would attempt the sea-crossing again, perhaps to the Bahamas. Haitians have huge difficulty accessing a Visa to enter the US – a dream held by many – even a holiday Visa. For the most part they are trapped here in their own country where resources and opportunities are so lacking or simply non-existent for the average Haitian. They are hard workers and their life is not easy. They walk miles and miles in terrific heat just to get the basics of life and do the basic necessities for life – collect water, go to the market to buy and sell their home-grown produce, send their children to school and eek out a living in whatever way they can. They have no State support for education, health or disability. If they have no money, they simply go hungry. This is certainly one country in the Western world where obesity is not an issue, despite the fact that it probably produces more sugar than many other countries. Here in Jean Rabel and its surroundings, sugar-cane grows everywhere. Small landholdings grow the crop right alongside the wall of their homes. Some people produce rum from the crop and once there is a good harvest they can make some decent money. But in this land of intense heat and precarious hurricanes a good harvest is never guaranteed. 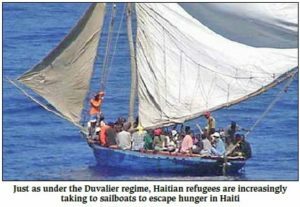 If I were Haitian, who knows, would I attempt escape in a rickety boat for the hope of a better life somewhere else? I think I might!